If you saw on Hello Jennifer Helen just before Christmas, you’ll know that I decided to sign up with a personal trainer to kick off 2016. I wanted to share the journey I am going along because, before I met Sarah, I thought the idea of getting a personal trainer was way beyond me both financially and physically. Sarah completely changed my idea of that and really inspired me to make the change for myself in the year that I get married and turn 30. I kind of think, if I don’t do it now, I’ll probably never do it. So I’m carpe-ing that diem and just bloody well going for it. And I hope that by sharing my journey, it might inspire others to get into the zone. This week, I had the pleasure of my first meeting with Sarah. We sat down and ran through everything I’m going to be doing over the next ten weeks and exactly what I can expect. Needless to say, it was thoroughly terrifying and yet really exciting at the same time. We’re going to tackle two aspects of my health – my nutrition and my fitness. This post tackles the nutrition side of the plan, my next will tackle the fitness. First things first, the DIET word is banned. Diet has such terrible connotations of being solely about weight loss, but this is about tackling the way I look at food forever. 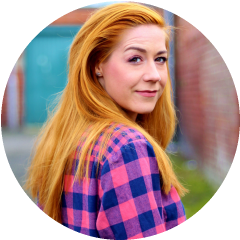 Sarah sent me through my shopping list for the week and it is chock full of health – lean white meat and fish, vegetables, salad, seeds and loads more yummy looking stuff. I put in a huge Sainsbury’s order and it was all delivered ready to hit the week running on Monday morning. Sarah will email me every day with a list of what I’m allowed to eat the next day. So instead of being curled up in front of the telly I’m going to be prepping food every night, wahoo! Instead I’ll be eating tonnes of protein – meat or fish with every meal (including breakfast!!!!!!!) and plenty of vegetables. I think it’s going to be a bit weird because I won’t be able to eat the same thing as Andrew a lot of the time and I can’t just pick at fruit, which I kind of see as the bestest thing to snack on when I get that 3:30pm slump. Anyhoo, I totally trust my personal trainer so I am going to throw myself in! I’ve got to chug at least THREE litres of water a day. For someone who sometimes struggles to get in two pints, I know this will be a challenge. Watch this space…. As well as that, my nutrition plan includes NO BOOZE (cheerio bourbon, you lovely, lovely drink of the Gods). I’m not too worried about this because I’m not the kind of person who has a casual glass of rouge on a night. It’s Saturday night right now and I’m sat here with my bottle of water. Rock n roll to the bone. 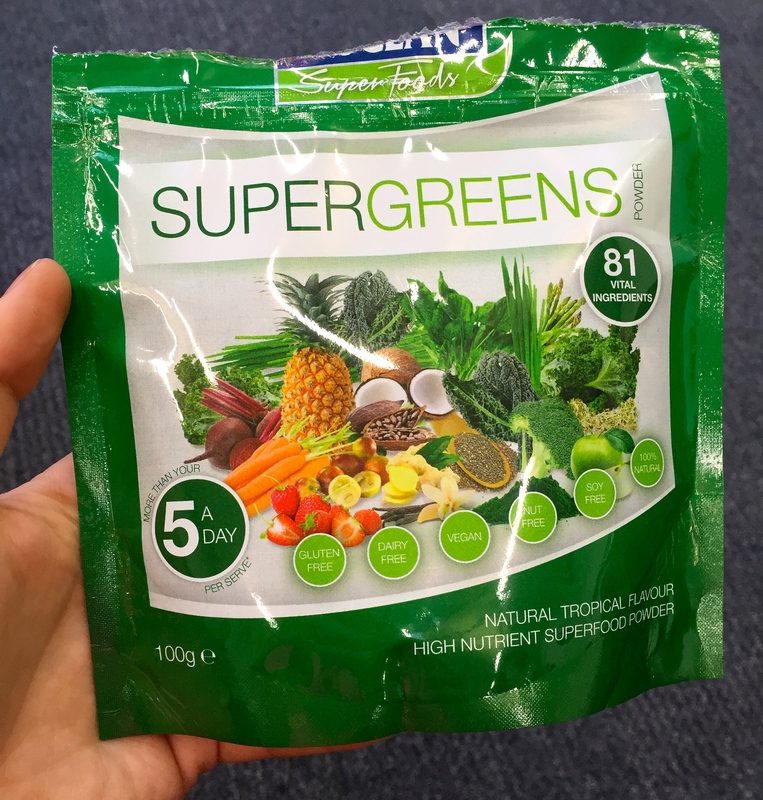 I’ve heard loads about Supergreens before – a couple of friends of ours started a health kick last year and absolutely swear by them and I know another very healthy girl who gives them to her kids disguised as chocolate milkshakes! They’re not something I’ve tried before as I think they look like pond water and they cost a frigging fortune, but they’re part of the plan so drink them I will. I’ve also been advised to start taking Omega 369 to get a healthy source of fats in me. Thank heaven for the penny sale at Holland and Barrett, as these bad boys are expensive. But I’ve been told the more expensive, the better the quality. 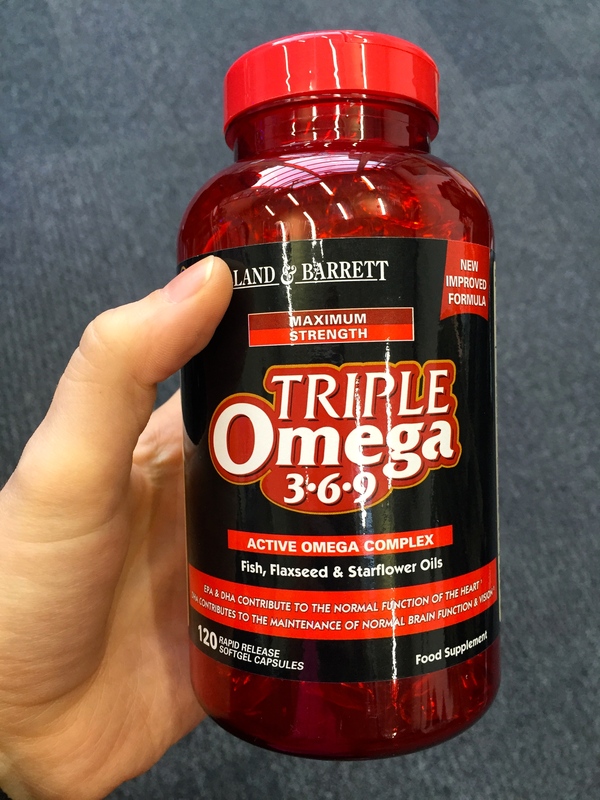 You can get them at supermarkets and Boots as well, but the actual amount of fish oils in them is a lot less. So that’s my nutrition plan in (a long – soz) nutshell! I’m going to keep track of my progress on here so keep checking back if you want to know more. Is anyone else starting 2016 with a healthy bang? Let’s share the love below! Ive been on a healthy journey for more than a year now with the occasional treat here and there and I’ve lost a bit of weight and dropped a clothing size 🙂 it’s all about eating right and NOT doing any crazy diets :p GOOD LUCK! Thanks Pam – 14 days left and I’m still going strong! I’m away to start a new plan with a new coach at the end of the month in prep for my wedding this year too! Looking forward to seeing how you get on with yours. I’m not a fan of a low carb approach but it’ll be interesting to hear your thoughts as you go through your plan! Once you get into it, it’s not too bad! I’d recommend buying a big water bottle and keeping it on your desk. Then you drink without thinking about it!